In these gripping accounts of true cases, bestselling author Atul Gawande performs exploratory surgery on medicine itself, laying bare a science not in its idealised form, but as it actually is - complicated, perplexing and profoundly human. This is a stunningly well-written account of the life of a surgeon: what it is like to cut into people's bodies and the terrifying - literally life and death - decisions that have to be made: operations that go wrong; of doctors who go to the bad; why autopsies are necessary; what it feels like to insert your knife into someone. Atul Gawande mostra com exemplos e com linguagem simples um mundo que é vivenciado por médicos e por vezes incompreendido pelos pacientes. Mostra ainda a arte que cerca essa ciência imperfeita que é a Medicina. Recomendo tanto para médicos quanto para pacientes. O livro é bastante esclarecedor e ajuda a deixar claro o qto humano são os médicos. 5,0 de 5 estrelasSurgeons are people, too. I was referred to this book by a friend of mine who knew I liked the books of Malcolm Gladwell. I first read it near about when it came out, around 2002, and just got around to re-reading it. I had only remembered two of the stories from the book, so it was very similar to reading it again for the first time. The theme of this book is reflected in its three parts: Fallibility, Mystery and Uncertainty. 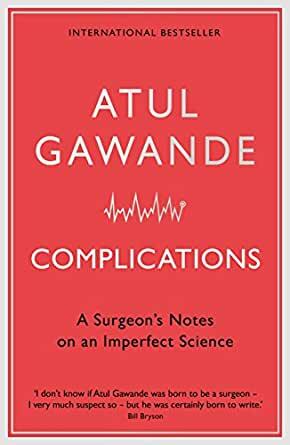 Each part talks about a particular aspect of Gawande’s career as a surgeon that deals with the less-certain side of being a doctor. Each concept is accompanied by one or more anecdotal references to his own real-life cases that illustrate his point brilliantly. And that point is that doctors know a lot - but they don’t know everything. Their education and practical experience can help prepare them with knowledge, but skill comes from years of learned real-world practice. I could really sympathize with him and the stressors he has to deal with. I’ve been guilty as well of feeling my doctor must and should know everything that is right for me to do. The truth is a lot more complicated than that. This book doesn’t even take into consideration the patient frustrations with healthcare - cost, attention, etc. It really does focus on pulling the screen back and giving you a glimpse into the vast uncertainty that accompanies this sometimes wondrous profession. This is NOT a book that says, “I’m a surgeon. Here’s all the supercool things I’ve done and this is why I’m awesome and don’t you wish you could get me as your doctor?” This book shows the doctor, warts and all, and makes them much more human. The author writes from the viewpoint of a resident and young surgeon covering such topics as When Doctors Make Mistakes, When Good Doctors Go Bad, Pain, Nausea, Obesity and the Ethics involved in end-of-life decisions. His excellent writing makes the hospital setting and the O.R. come very much alive. Doctors are portrayed as human beings with a high fallibility factor and surgeons are portrayed with very high confidence levels. Yet the doubts, the anxiety and the frustrations of the medical profession are also expressed very eloquently. His insight into the medical world is almost profound and his empathy with the patient is palpable. Gawande has written other medical books for the popular market that have gotten good reviews. I hope to read them soon. 5,0 de 5 estrelasThe rare intersection of a man of action (a surgeon) and a man of words (an author). People usually are either one of these things or the other, and it's not so often that we find someone who can both do things AND write and so expose us to a world that we might not have seen otherwise. 1. It is written in three sections. 2. I get the distinct impression that the author wrote a series of essays and then chose the best of them as could be fit into this book. It's like he didn't write only as many "songs" as he needed for this "album." He had a whole bunch of them in a vault somewhere and then just pulled some number of them together and then made the concept of the "album" after the fact. 1. Medicine is an empirical science. A lot of things are learned/ decided on the fly and with more information they might have been decided differently. There are no algorithms or simple answers. 2. There are questions about ways that surgeries can be set up. Do you train one surgeon to do many things, or do you train many surgeons (teams?) to do one thing only. The discussion of the hernia repair team and the way that they improved their efficiency by doing the same thing OVER AND OVER again (p. 35) is food for thought. 3. The training of physicians has to happen on *someone*. And the training for procedures to be done on humans can only be done on humans. And yes, people who are poor and unable to purchase their own insurance are more likely to be guinea pigs. And that's just the reality of things. 4. There are no clear mechanisms to sanction physicians when they are past their prime and start killing patients. This book is about 15 years old, but then (as now), government accountants and colleagues will catch the physician before any ethics/ disciplinary board. Verdict: Recommended. The fact that this book is still high priced in spite of being 15 years old is its strongest recommendation. The present reviewer is offering one more. 5,0 de 5 estrelasA great read! Unable to be put down until completed! As a former Navy Corpsman (Medic) attached to the USMC infantry, I have always had an interest in medicine, and science in general, and this book was a great insight into the medical and surgery field. As a young Corpsman with the Marines, I was thrust into medicine, and learned very quickly what did and did not work. "Watch one, do one, teach one" is how we were instructed to learn medical practices. From diagnosing (even though we couldn't "diagnose" as Line Corpsmen...we still did essentially) cellulitis, learning to place sutures, to removing infected toenails, I made mistakes, but generally our medical skills quickly flourished, and we were able to practice outstanding medicine for the grunts. Atul writes about this, and the decisions he had to make, which affect him to this day. As a surgeon and author, he actually cares about his patients, which is a great thing to have as a medical professional. While he doesn't touch on this very much in his book, his caring about the patients and following up is the mark of a true caregiver. For it is those doctors, medics, corpsmen, nurses, and other medical professionals that actually care and are empathic with their patients, yet know how to distance themselves when needed, that operate the best and can change medicine for the better. A truly great read, I would recommend this book to anyone interested in the healthcare system, surgery, medicine, and anyone who has ever worked in the medical field!